Students and staff farewelled Union Court today, with promises from the Vice-Chancellor of a more functional venue to come after redevelopment. 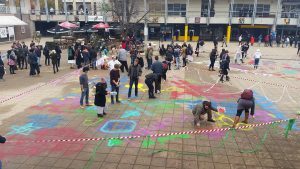 The ANU community said goodbye by making their mark on Union Court before it is demolished. Vice Chancellor Brian Schmidt described the role of Union Court in the traditions of the university as the home for “O-week, market day and student elections”. Schmidt joked that the court “still sparkled after forty years”. He justified the redevelopment by arguing the new court will “be something consistent with the university we love”. ANUSA President, James Connolly touched on the role of union court in the political life and advocacy at ANU, calling it “the means by which the student voice is amplified”. Connolly also reiterated the role of Union court in student life speaking on concerts and the role of the bar. Connolly assured the audience that all changes after redevelopment would be “informed by the student voice”. After speeches, the vandalism began. Admitting to general surprise that he doesn’t have a tag, Schmidt opened the official spray painting with “No Schmidt No Progress”. He later explained to Observer “we’ve got to have 18 months of pain to make progress”. 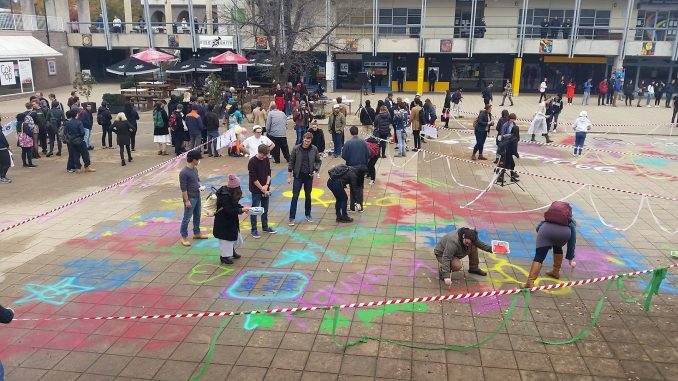 While Schmidt opened the official spray-painting, the aftermath of last night’s protest were clear to the present audience, despite ANU’s attempts to erase it. The floor was opened to students and spray painting began proper. We collated a few of our favourites here, including a visit by ANUGothic, echo360 guy and a love letter to Observer (call us).